This picture has never liked the artist. She accused herself of “passive” naturalism and photographicism, assessing the overall picture quality as very average. However, such self-deprecation of the artist is not due to the mediocrity of the painting (which was not even true), but by the feeling that Yablonskaya did not want to admit even to herself – oppression and the need to write on the subject and to order. And if the writing of “Bread” could be justified by the creative impulse that inspired the artist, then the forced compromises in the person of “Spring”, marked by the second Stalin Prize, received the stamp of failure. And in vain! After all, this canvas absorbs all the signs of the Yablonskaya style, and the social order has nothing to do with it. The artist chose mothers walking with her children in the park as the object of the image. 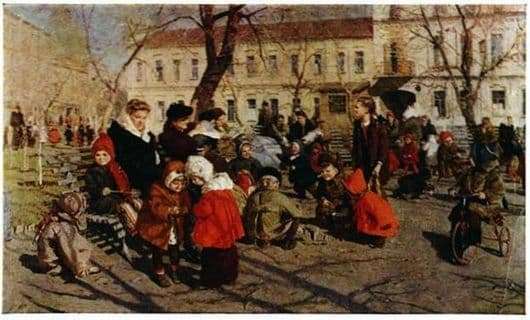 This sets the theme of childhood, very productive for the further work of Yablonskaya (“Morning”, “Cold”). Naturalism, in which the artist so groundlessly accused herself, is all the same impressionism. “The impression is more valuable than knowledge,” said Yablonskaya. These words could well become a worthy motto of any impressionist. Yablonskaya very skillfully conveys the expressions of the faces of women sitting on the benches – gentle, tender and at the same time strict, focused. There is no need to talk about children: for each little character in her picture, the artist found an emotion. Someone is fascinated looking into the distance, someone with a deep interest is looking at a certain object in his hands. We add that the canvas is all filled with the movement of children playing with enthusiasm and women peacefully talking about household matters. All this creates a feeling of light, which bears in itself each work of the artist. In the future, Yablonskaya will make a couple more sketches on everyday topics that will be opened to the general public fifteen years after they are written. Addressing this topic after “Spring”, its development speaks about the non-randomness of the presence of this painting in the creative evolution of the artist.